Want to win a new car and support the White Sox charitable efforts? 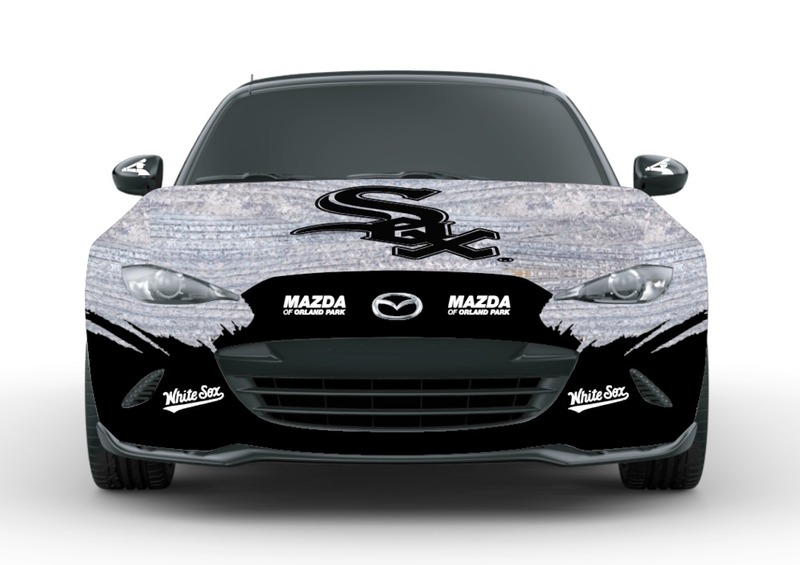 The club and Chicago White Sox Charities are again offering the chance for one lucky fan to drive away in a White Sox-themed 2019 Mazda Miata MX 5 donated by Mazda of Orland Park. Ticket purchasers are also entered to win monthly prizes, and continue to be eligible to win the car! The winner will be awarded the car on-field -- and have his/her photo taken -- at a White Sox home game at Guaranteed Rate Field. Raffle tickets are on sale now at the following prices: 1 for $10, or 4 for $20. Raffle tickets also will be available at Guaranteed Rate Field starting on April 4, the 2019 White Sox Home Opener. All net proceeds of the Raffle will benefit Sponsor, a 501(c) (3) charity, and the programs that Sponsor supports. Programs include, but are not limited to, cancer research and treatment programs, youth education, health and wellness initiatives, and programs for families and individuals in crisis. Enter by 1:00 p.m. CT on August 30, 2019. Open to legal residents of Illinois who are of legal age of majority in their jurisdiction (and at least 18 years of age) at the time of entry. For Prizes that include game tickets: TRANSPORTATION TO/FROM THE GAME AND LODGING NOT INCLUDED. One (1) Grand Prize and five (5) monthly prizes will be awarded. Odds of winning depend on the number of eligible entries received as of the applicable Drawing Date Deadline. Enter by purchasing a raffle ticket either online or in person at Guaranteed Rate Field. Limit one (1) Monthly Prize per person, family or household. Void where prohibited. See Official Rules, which govern, for complete details. Sponsor: Chicago White Sox Charities, 333 W. 35th Street, Chicago, IL 60616. OFFICIAL RULES: By participating, entrants agree to be bound by these Official Rules and by the decisions of Sponsor, which shall be binding and final as to all matters related to the White Sox sponsored raffle for a vehicle as described below (the "Raffle"). The Raffle is subject to all applicable federal, state and local laws. SPONSOR: Chicago White Sox Charities, 333 W. 35th Street, Chicago, IL 60616 ("Sponsor"). NET PROCEEDS: All net proceeds of the Raffle will benefit Sponsor, a 501(c) (3) charity, and the programs that Sponsor supports. Programs include, but are not limited to, cancer research and treatment programs, youth education, health and wellness initiatives, and programs for families and individuals in crisis. ELIGIBILITY TO ENTER: During the Entry Period specified below, Raffle tickets may be purchased in accordance with these Official Rules either at Guaranteed Rate Field in Chicago, Illinois or on the Internet, by following the instructions at www.whitesox.com. Raffle tickets may be purchased ONLY BY PERSONS WHO ARE 18 YEARS OF AGE OR OLDER. All fans, regardless of their state of residence, may purchase Raffle tickets in person at Guaranteed Rate Field in Chicago, Illinois. Internet sales of Raffle tickets are open ONLY TO LEGAL RESIDENTS OF ILLINOIS. This Raffle is VOID OUTSIDE ILLINOIS AND WHEREVER PROHIBITED BY LAW. The following persons are NOT ELIGIBLE to participate in the Raffle or to win any Prize: Employees, officers, directors, shareholders, partners, agents of Chicago White Sox Charities, the Chicago White Sox, Ltd., the other MLB Entities (defined below), At Your Service, Inc., Roclab Athletic Instruction, LLC, Silver Chalice Ventures, LLC, Illinois Sports Facilities Authority, the Raffle ticket fulfillment house, and the printer of the Raffle tickets, and any parent, subsidiary, affiliated entity, partially owned entity, contractor, consultants, advertising agencies, promotion agencies (collectively, the "Ineligible Parties") and immediate family members of any Ineligible Party. "Immediate family members" means spouses, parents, grandparents, children, grandchildren, and siblings (and any of their respective spouses) of an Ineligible Party. "MLB Entities" means the Office of the Commissioner of Baseball ("BOC"), its Bureaus, Committees, Subcommittees and Councils, the Major League Baseball Clubs ("Clubs"), MLB Advanced Media, L.P., Major League Baseball Properties, Inc., The MLB Network, LLC, each of their parent, subsidiary, affiliated and related entities, any entity which, now or in the future, controls, is controlled by, or is under common control with the Clubs or the BOC and the owners, general and limited partners, shareholders, directors, officers, employees and agents of the foregoing entities. PURCHASING RAFFLE ENTRIES: Raffle tickets may be purchased for ten dollars ($10.00) each or four (4) tickets for twenty dollars ($20.00) by eligible persons (see "ELIGIBILITY TO ENTER" above) from 10:00 a.m. Central Time ("CT") on March 29, 2019 ("Start Date"), through 1:00 p.m. CT on August 30, 2019 (the "End Date") and the period referred to as the "Entry Period." A maximum of 25,000 tickets will be sold. There are two (2) ways to purchase Raffle tickets (each ticket, an "Entry") during the Entry Period: (1) during the entire Entry Period tickets may be purchased in person at Guaranteed Rate Field (333 W. 35th Street, Chicago, Illinois): (a) at the Guaranteed Rate Field ticket office, on non-game days, Monday through Friday from 10:00 a.m. CT to 6:00 p.m. CT and on Saturdays and Sundays from 10:00 a.m. CT until 4:00 p.m. CT; and on game days from 9:00 a.m. CT until two (2) hours after the scheduled start of the game and; (b) during home games, at designated sales locations inside Guaranteed Rate Field, from ninety (90) minutes prior to the scheduled start of the game through the end of the sixth (6th) inning. --OR-- (2) on or after Start Date through the End Date, on the Internet, by visiting www.whitesox.com and following the directions to purchase and print a Raffle ticket. Credit cards must be used to pay for online ticket purchases and residency status within the State of Illinois for eligibility purposes will be determined by the address assigned to such credit card. Sale of Raffle Tickets either at Guaranteed Rate Field or through the internet or both may be suspended or stopped at any time at the sole discretion of Sponsor. The Internal Revenue Service takes the position that no portion of the Raffle ticket price will qualify as a charitable contribution for federal income tax purposes. TRANSFER/RESALE OF RAFFLE ENTRIES: TICKETS PURCHASED IN PERSON AT GUARANTEED RATE FIELD: Persons who purchase Raffle tickets in person at Guaranteed Rate Field may opt to give away or otherwise transfer their Raffle tickets to others, but in doing so they give up any claim they might otherwise have to the Prize if they surrender a winning Raffle ticket. Raffle tickets purchased at Guaranteed Rate Field may be given away to persons who are under 18 years of age, but only individuals who are 18 years of age or older may claim or win a Prize. Purchasers of Raffle tickets at Guaranteed Rate Field must sign their Entries at the time of purchase. All purchasers of Entries must provide their names, addresses, telephone numbers and (if available) e-mail addresses at the time of purchase. The Raffle is being conducted pursuant to a raffle license issued to Sponsor by the City of Chicago. Purchasers of Raffle tickets at Guaranteed Rate Field may not re-sell their Raffle tickets to other parties, and may not knowingly give such Raffle tickets away to others for the purpose of allowing those other parties to re-sell such Raffle tickets. All Raffle tickets which have been resold in violation of these Official Rules may be voided at the discretion of Sponsor. All individuals who re-sell Raffle tickets in violation of these Official Rules may be ineligible to participate in the Raffle or to win any Prize at the discretion of Sponsor. TICKETS PURCHASED ONLINE AT WWW.WHITESOX.COM: Tickets purchased online at www.whitesox.com may not be given away or otherwise transferred. To be valid, an Entry purchased on the Internet must be downloaded from the website at www.whitesox.com and printed by the entrant at the time of purchase. Entrants purchasing Raffle tickets online must digitally sign their Entries, using the procedures specified on www.whitesox.com. The purchaser of the online Raffle tickets, as determined by credit card purchase records, will be considered the lawful owner of the online raffle ticket. The Raffle is being conducted pursuant to a raffle license issued to Sponsor by the City of Chicago and online purchasers must be residents of the State of Illinois, as determined by the address assigned to the purchaser's credit card used to purchase such Raffle tickets. Purchasers of Raffle tickets on www.whitesox.com may not re-sell their Raffle tickets to other parties, and may not knowingly give such Raffle tickets away to others for the purpose of allowing those other parties to re-sell such Raffle tickets. All Raffle tickets which have been resold in violation of these Official Rules may be voided at the discretion of Sponsor. All individuals who re-sell Raffle tickets in violation of these Official Rules may be ineligible to participate in the Raffle or to win any Prize at the discretion of Sponsor. VALIDITY AND ELIGIBILITY OF ENTRIES: Sponsor shall be the sole judge of the validity and eligibility of all Entries. Entries generated by script, macro or other automated or mechanical means are void. Entries which have been or appear to be tampered with are void. All Entry purchases shall be final, and no refunds or replacements will be issued by Sponsor. All Raffle Entries must be purchased no later than 1:00 p.m. CT on the End Date, whether purchased at Guaranteed Rate Field or on the Internet at www.whitesox.com. DRAWINGS FROM ENTRIES: On each date set forth in the prize Section below (each, a "Drawing Date"), Sponsor shall conduct a random drawing (each, a "Drawing") to randomly select one (1) potential prize winner from among all eligible Entries received as of 1:00 p.m. CT on the applicable Drawing Date, except for Drawing Dates September 3, 2019, and September 5, 2019, from among all eligible Entries received (each, a "Drawing Date Deadline"). Subject to verification of eligibility and compliance with the terms of these Official Rules, the potential winners will be declared the official winners of the Raffle (each an "Official Winner" and collectively, the "Official Winners"). Limit one (1) Monthly Prize per person, family or household. Odds of winning depend on the total number of eligible Entries received as of the applicable Drawing Date Deadline as described above. All non-winning eligible Entries from one Drawing Date automatically carry-over to and remain eligible for subsequent Drawing Date(s), if any; all eligible Entries carry-over to and remain eligible for the final Drawing. Each Drawing will be held at Guaranteed Rate Field, 333 W. 35th Street, Chicago, Illinois on the applicable Drawing Date after 1:00 p.m. CT. The winning ticket number will be displayed on www.whitesox.com as soon as practical after the applicable Drawing Date. In addition, from 8:00 p.m. CT through 11:59 p.m. CT on a Drawing Date, individuals may call 312-674-5121 to hear a recorded announcement of the winning Raffle ticket number. The owner of the winning Raffle ticket number will have until 11:59 p.m. CT on the fifth (5th) business day after the applicable Drawing Date to claim his/her Prize, excluding the September 5, 2019, Drawing Date. For the September 5, 2019 (Grand Prize) Drawing Date, the owner of the winning Raffle ticket will have until 11:50 p.m. CT on September 13, 2019, ("Grand Prize Claim Date) to claim his/her Grand Prize. PRIZES: One (1) grand prize (the "Grand Prize") and five (5) monthly prizes (each, a "Monthly Prize" and together with the Grand Prize, the "Prizes") will be awarded at the sole discretion of Sponsor as follows: Drawing Date	Prizes Awarded	Prize	Prize Details	Approximate Retail Value 5/1/2019	One (1) (Monthly Prize)	20 Suite Tickets for a 2019 game	One (1) Official Winner will receive twenty (20) Diamond Suite tickets (standard food and beverage package with alcoholic and nonalcoholic beverages as provided in the Diamond Suite on the date of the game) for use by Official Winner and nineteen (19) guests for one (1) mutually (Sponsor and Official Winner) agreeable Chicago White Sox 2019 regular season home game. $ 3,200.00 6/1/2019	One (1) (Monthly Prize)	Batting Practice Viewing for four (4) One (1) Official Winner will receive four (4) Gold Box tickets for Official Winner and three (3) guests for one (1) mutually (Sponsor and Official Winner) agreeable Chicago White Sox 2019 regular season home game; and the opportunity for Official Winner and his/her three (3) guests to view Chicago White Sox pregame batting practice from the field. $1,000.00 7/1/2019	One (1) (Monthly Prize)	Four (4) Guaranteed Rate Club Tickets for 2019	One (1) Official Winner will receive four (4) Guaranteed Rate Club tickets for Official Winner and three (3) guests for one (1) mutually (Sponsor and Official Winner) agreeable Chicago White Sox 2019 regular season home game. $850.00 8/1/2019	One (1) (Monthly Prize)	On-field photo with White Sox Player or Coach	One (1) Official Winner will receive the opportunity for Official Winner and his or her three (3) guests to take a photo on the field pre-game, with one (1) Chicago White Sox player or coach (determined by Sponsor at its sole discretion); and four (4) Gold Box tickets for Official Winner and three (3) guests for one (1) mutually (Sponsor and Official Winner) agreeable Chicago White Sox 2019 regular season home game. 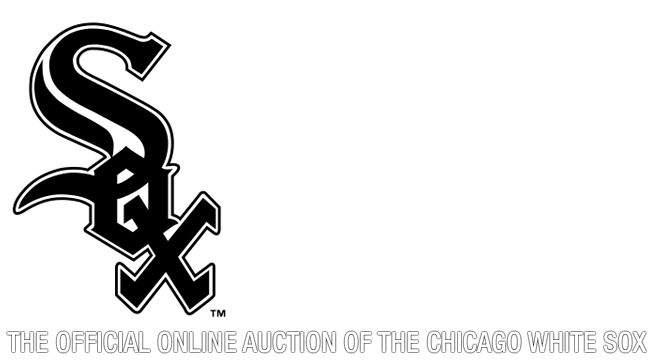 $750.00 9/3/2019	One (1) (Monthly Prize)	Autographed Jersey of Current Player of Choice	One (1) Official Winner will receive one (1) autographed Chicago White Sox jersey of choice signed by one (1) Chicago White Sox player on the 25-man roster at the time of the applicable Drawing Date. 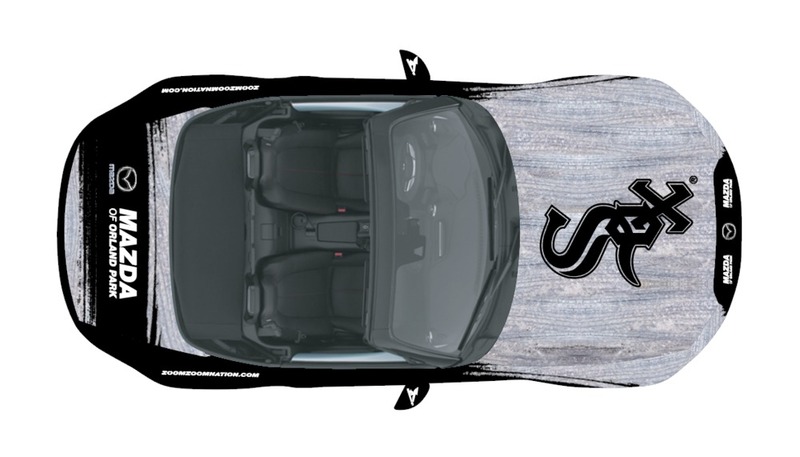 $300.00 9/5/2019	One (1) (Grand Prize)	2019 Mazda Miata MX 5 Brand Vehicle One (1) Official Winner will receive one (1) Chicago White Sox-branded 2019 Mazda Miata MX 5, and four (4) tickets for Official Winner and three (3) guests for one (1) Sponsor-determined Chicago White Sox 2019 regular season home game. The specific vehicle awarded to the Winner will be determined by Sponsor in its sole discretion. $26,970 The Prizes are awarded "AS IS," and Sponsor and the Released Parties (defined herein) expressly disclaim any warranties, express or implied, including but not limited to the warranties of merchantability and fitness for a particular purpose, relating to the Prizes in any way. Winners may not substitute, assign or transfer the Prizes or redeem the Prizes for cash. Winners will be responsible for all applicable federal, state and local income taxes. For Prizes that include game tickets: TRANSPORTATION TO/FROM THE GAME AND LODGING NOT INCLUDED. The exact nature and duration of any experience/opportunity awarded shall be determined by Sponsor at its sole discretion and subject to availability and Sponsor's rules and regulations. Seat locations at the game and, unless stated otherwise in the Prize description, exact game date shall be determined in the sole discretion of Sponsor. Each Official Winner's guest(s) must be of legal age of majority in his/her(their) jurisdiction(s) of residence (and at least eighteen (18) years of age), unless accompanied by a parent or legal guardian. Major League Baseball game, event and exhibition dates and times are determined in the sole discretion of the BOC and/or the applicable Club, as applicable, and may be subject to change. The terms and conditions of the tickets awarded as part of any Prize will govern in the event a legal game, event or exhibition, as defined by Major League Baseball, is not played or held, as applicable, due to weather conditions, an act of God, an act of terrorism, civil disturbance or any other reason. Each Official Winner and his/her guest(s) agree to comply with all applicable ballpark and venue, as applicable, regulations in connection with the Prize. Sponsor and the applicable MLB Entities reserve the right to remove or to deny entry to any Official Winner and/or his/her guest(s) who engage(s) in a non-sportsmanlike or disruptive manner, or with intent to annoy, abuse, threaten or harass any other person at the game, event or exhibition. Released Parties will not be responsible for weather conditions, Acts of God, acts of terrorism, civil disturbances, work stoppage or any other natural disaster outside their control that may cause the cancellation or postponement of any Major League Baseball game, event or exhibition. Major League Baseball game, event and exhibition tickets awarded as prizes may not be resold or offered for resale or used for any commercial or promotional purpose whatsoever. Any such resale or commercial or promotional use may result in disqualification and Prize forfeiture, and may invalidate the license granted by the game, event or exhibition ticket(s). NOTIFICATION OF POTENTIAL WINNERS: Owners of eligible Entries need not be present in person on the Drawing Date in order to win. Sponsor will endeavor to contact the purchaser-of-record of the winning Entry ("Potential Winner") by mail, phone or email immediately after the Drawing, to notify such person that he/she is the Potential Winner, but only if and to the extent that Sponsor can successfully identify and contact such Potential Winner based on the identifying and contact information supplied by the purchasers of the Entry in question. WHETHER OR NOT CONTACTED BY SPONSOR, POTENTIAL WINNER MUST CONTACT SPONSOR TO CLAIM HIS/HER PRIZE NO LATER THAN 11:59 P.M. CT FIVE (5) BUSINESS DAYS AFTER THE APPLICABLE DRAWING DATE (EXCLUDING THE SEPTEMBER 5, 2019, DRAWING DATE. FOR THE SEPTEMBER 5, 2019 (GRAND PRIZE) DRAWING DATE, THE OWNER OF THE WINNING RAFFLE TICKET WILL HAVE UNTIL SEPTEMBER 13, 2019 TO CLAIM HIS/HER GRAND PRIZE) BY APPEARING IN PERSON AT SPONSOR'S OFFICES AT 333 W. 35th STREET, CHICAGO, ILLINOIS, OR BY SENDING AN EMAIL CONTAINING THAT POTENTIAL WINNER'S CONTACT INFORMATION TO whitesoxraffle@whitesox.mlb.com SO THAT SPONSOR MAY INSPECT AND VERIFY CLAIMANT'S RAFFLE TICKET. If the Potential Winner has not claimed his/her Prize by following the procedures noted above and have not claimed the Prize by 11:59 p.m. CT on the fifth (5th) business day after the applicable original Drawing Date (or, with respect to the Grand Prize, by September 13, 2019), he/she shall no longer be eligible to win the applicable Prize and a new Potential Winner will be selected from among all remaining eligible Entries received as of the applicable Drawing Date Deadline. The same drawing, posting and notification procedures will be used, except the new Potential Winner will have until 11:59 p.m. CT on the seventh (7th) full day following the applicable new Drawing Date to claim the Prize; the 7 day deadline will also apply to the Grand Prize. If the Prize/Grand Prize is not claimed by 11:59 p.m. CT on the seventh (7th) full day following the applicable new Drawing Date, the procedures in the preceding sentence will be repeated until an eligible entrant properly claims the Prize in the proper manner and within the proper time constraints. DETERMINATION OF OFFICIAL WINNERS: Sponsor shall have the sole discretion to determine whether the Potential Winners are Official Winners. Sponsor's decision concerning the identity of an Official Winner shall be final and binding. To become an Official Winner; (1) a Potential Winner must be eligible to participate in the Raffle under these Official Rules and must not be in violation of these Official Rules as determined in Sponsor's sole judgment; (2) that Potential Winner must contact Sponsor, or be contacted by Sponsor, by the deadline specified above under "NOTIFICATION OF POTENTIAL WINNERS"; (3) that Potential Winner's winning Entry must be inspected and verified by Sponsor and, if such Potential Winner's raffle ticket was purchased in person at Guaranteed Rate Field, Potential Winner must present the winning ticket; (4) that Potential Winner must execute and return to Sponsor an affidavit of eligibility on a form to be provided by Sponsor; and (5) that Potential Winner must provide Sponsor with all tax identification information required by federal, state or local law and, where applicable, provide Sponsor with payment for any required withholding taxes due prior to that Potential Winner's receipt of the Prize. If for any reason whatsoever all of the foregoing requirements are not satisfied with respect to a particular Potential Winner, or if Sponsor is unable for any reason to identify the holder of a winning Raffle ticket or to contact a Potential Winner, then that Potential Winner's Prize will be deemed forfeited and, at Sponsor's sole discretion, an alternate Potential Winner of that Prize will be selected, through another random drawing from among all remaining eligible Entries received as of the applicable Drawing Date Deadline in accordance with the procedures noted in "Notification of Potential Winners" above. Sponsor shall use the following rules to determine the identity of any Potential Winner and of the Official Winners: (1) in the case of a Raffle ticket that was purchased at www.whitesox.com, Sponsor shall conclusively presume that the purchaser of that ticket, as determined by credit-card purchase records, is the lawful owner of that Raffle ticket and such purchaser resides at the billing address of record, and (2) in the case of a Raffle ticket that was purchased at Guaranteed Rate Field, Sponsor shall conclusively presume that the person who is in possession of that Raffle ticket is the lawful owner of that Raffle ticket and Sponsor shall not make, nor have any duty to make, any inquiry whatsoever into the circumstances under which that person came into possession of such winning Raffle ticket. In the unlikely event that an error or problem in the administration of the Raffle results in two (2) Raffle ticket purchasers holding winning Raffle tickets that contain identical ticket numbers, then the person who has record of the earliest ticket purchase shall be deemed to hold the winning Entry. AWARD OF PRIZES TO OFFICIAL WINNERS: The Grand Prize will be awarded to the applicable Official Winner and presented to the applicable Official Winner at Guaranteed Rate Field prior to a to-be-determined (by Sponsor at its sole discretion) 2019 Chicago White Sox regular season home game. Such Official Winner must accept his/her Grand Prize in person, unless Sponsor approves, in its sole discretion, other arrangements for the delivery of the Grand Prize to that Official Winner. The value of the Grand Prize is $26,970. The Monthly Prizes will be sent via mail to the applicable Official Winners, or may be picked up at Guaranteed Rate Field, 333 W 35th St, Chicago, IL 60616. The Official Winners shall be solely responsible for their own transportation and other travel costs and lodging associated with their attendance at the presentation of the Grand Prize at Guaranteed Rate Field or at the game for which their Monthly Prize includes tickets; or for the picking up of their Prize from Guaranteed Rate Field, as applicable. TAXES: All federal, state and local income taxes are the sole responsibility of Official Winners. No taxes will be charged to the Official Winners. The taxable value of the Prizes will be treated as ordinary income to the Official Winners for federal and state income tax purposes, and each Official Winner will be required by law to pre-pay a portion of the tax liability incurred in connection with his/her receipt of the applicable Prize before receiving his/her Prize from Sponsor. GENERAL CONDITIONS: The Released Parties (defined below under "RELEASE OF LIAIBLITY") are not responsible for (1) Entries which are stolen, lost, damaged, illegible, given away or no longer in the purchaser's possession, (2) Entries that have been or may have been tampered with or re-sold in violation of these Official Rules; (3) Entries, payments for Entries or any other Raffle-related communications which are lost, late, incomplete, inaccurate, delayed, misdirected, undelivered, not fully captured, or garbled as a result of any failure or problem whatsoever with the availability, functionality, operability or use of any network, server, ISP, website, Internet connection, computer, telephone, cable or satellite modem or connection, hand-held mobile device or any other computer equipment or connection, whether or not caused by site users, tampering, hacking, or by viruses, worms, or malfunctions affecting a network, server, ISP or any equipment or programming used in or associated with the Raffle; (4) the inability of a purchaser or prospective purchaser of an Entry to connect or stay connected to the Internet, to log on to any website, or to participate in or complete any online communication or activity related to the Raffle; (5) any other errors of any kind, whether human, typographical, printing, mechanical, or electronic in nature, which relate to or are connected with the Raffle (collectively, as described in clauses (1) through (5), "Errors"), including without limitation, Errors in Raffle-related materials or in the administration of the Raffle, such as Errors in processing Entries, identifying Potential Winners, determining Official Winners, or announcing or delivering Prizes; or (6) any injury or damage to any person's computer or mobile device equipment related to or resulting from participation in this Raffle, the use of any website associated with the Raffle, or the downloading of any materials from such website(s). Anyone who tampers with or abuses any aspect of the Raffle or associated website, as determined in Sponsor's sole judgment, will be disqualified from participation in the Raffle and if applicable, will be deemed to have forfeited all claims to any Prize. If any portion of the Raffle is compromised, in Sponsor's sole judgment, by a virus, worm, bug, non-authorized human intervention or other causes which, in Sponsor's sole judgment, corrupt or impair the administration, security, fairness or proper play of the Raffle, or the proper submission or capture of Entries (collectively, a "Compromising Event"), then Sponsor reserves the right, in its sole discretion, to suspend, modify or terminate the Raffle, and to select the Potential Winners from among all eligible, non-suspect Entries received before the known occurrence or discovery of such Compromising Event. As a condition of entering this Raffle, each entrant agrees that (i) any and all disputes, claims, controversies or causes of action arising out of or relating to this Raffle, or any Prizes awarded (each, a "Claim"), shall not be consolidated or joined with or in any other proceeding involving a Claim of any other party; and (ii) under no circumstance will entrant be permitted to obtain awards for, and entrant hereby waives all rights to claim, punitive, incidental, consequential or any other damages, other than for actual out-of-pocket expenses. RELEASE OF LIABILITY: Entrants, by participating in the Raffle, agree that Chicago White Sox Charities, Chicago White Sox, Ltd., the other MLB Entities, Chisox Corporation and each of their respective parents, affiliates, subsidiaries, owners, partners, and advertising and promotion agencies, and all of their respective officers, directors, employees, representatives, shareholders, members, consultants and agents (collectively, the "Released Parties") will have no liability whatsoever for, and shall be held harmless by entrants against, any liability for injuries, losses, costs, expenses or damages of any kind, including damages for death, personal injury, property damage or property loss, resulting from, whether in whole or in part or directly or indirectly, participation in this Raffle or the acceptance, possession, misuse or use of any Entry or Prize. PUBLICITY RELEASE: Each Official Winner, by accepting his/her Prize, grants Sponsor and Sponsor's designees and affiliates, including Chicago White Sox, Ltd., full permission, except where legally prohibited, to use that Official Winner's name, address (city and state only), photograph, voice and/or other likeness and prize information for advertising, trade and promotional purposes without further compensation and without notice, review or approval, in all media now known or hereafter discovered, worldwide, and on the Internet and world wide web, in perpetuity. COPYRIGHT: All Raffle materials are copyrighted by Sponsor, and may not be copied, reproduced or used for any purpose without Sponsor's express prior written consent. GOVERNING LAW; SEVERABILITY: The Raffle and these Official Rules shall be subject to and governed by the laws of the State of Illinois. If a court of competent jurisdiction finds that any provision of these Official Rules, or their application to a particular persons or circumstances, is invalid or unenforceable to any extent, then the remainder of these Official Rules, and the application of all of these Official Rules to other persons or circumstances, shall not be affected by that determination, and shall remain enforceable to the fullest extent permitted by law.